Astroneer is a unique aerospace industry and interplanetary exploration game from System Era Softworks. 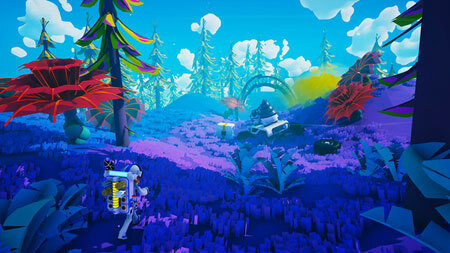 It is set during the 25th century Intergalactic Age of Discovery, where Astroneers explore the frontiers of outer space, risking their lives in harsh environments to unearth rare discoveries and unlock the mysteries of the universe. You can work together to build custom bases above or below ground, create vehicles to explore a vast solar system, and use terrain to create anything they can imagine. Your creativity and ingenuity are the key to thriving on exciting planetary adventures. You can reshape the ground under your feet as though it were made of clay. Use your deform tool to dig, collect, shape and build anything you wish. Use this ability to dig to the center of the planet, build a ramp into the sky, or make megaliths just by using terrain. Survive on and explore carefully crafted planets that can be entirely deformed and traversed. Items that you craft and find in the world can all be snapped and connected together to create unique creations for any situation. Customize and decorate your bases, vehicles, and Astroneer. Discover and uncover the mysteries of the solar system. If you get stuck in the game, check out the video walkthrough and gameplay for the game. This entry was posted in PC Games, Walkthrough and tagged Astroneer Cheats, Astroneer Gameplay, Astroneer Guide, Astroneer Strategy, Astroneer Walkthrough by Marvin. Bookmark the permalink.